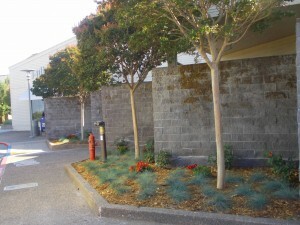 The Village at Corte Madera is taking steps toward more sustainable practices in their landscaping! We recently performed some landscape renovation work to planter beds on the east and west sides (against the buildings) of the shopping center. 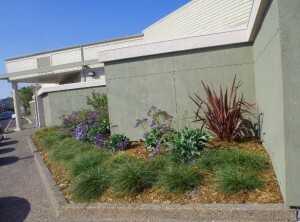 Drought resistant plantings including Ornamental grass (Fescue), Limonium, Phormium (New Zealand Flax), Cistus (Rock Rose) and Alstroemeria (Peruvian Lilly) were used. The irrigation system was converted to drip and each bed was mulched. Pure (100%) worm castings was used as a top dressing. Worm castings are certified organic, natural and odorless and have the appearance of coffee grounds. They slowly release nutrients needed for healthy plant growth and increased production rates. Worm castings can be used in aeration by incorporating it into the soil or it can be used as a top dressing which can then be covered with mulch. It helps soil water holding capacity and enables it to fight pests naturally.